Campbells Products 1958 Ad. 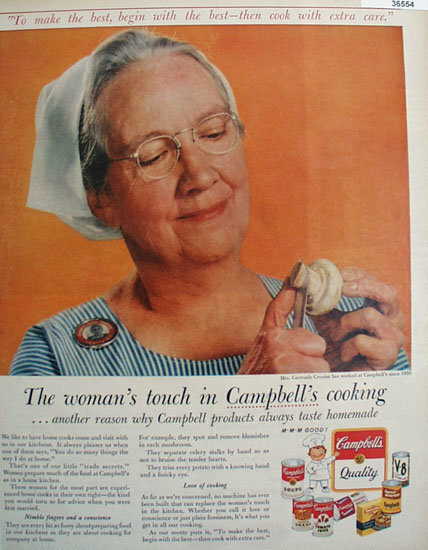 This color February 4, 1958 ad states the womans touch in Campbells cooking, another reason why Campbell products always taste homemade. Campbell Soups,V8 juice, Swanson Frozen Foods and Franco American Spaghetti. Picture shows Mrs. Gertrude Cronise who has worked at Campbells since 1935. Also shows Campbells products. Magazine tear sheet picture is taken through plastic and may show wrinkles or crookedness that is not in the ad. This Original magazine tear sheet measures 10 1/4 inches wide by 13 1/4 inches tall. Items Similar To "Campbells Products 1958 Ad"